Soft materials have traditionally been exploited to design and fabricate passive devices - such as tires, shock absorbers and vibration dampers. Here, I show that the use of soft materials in new structural layouts give the opportunity to create a new class of materials with responsive behavior. Although instabilities have traditionally been viewed as an inconvenience, I will show that they can be exploited to create materials with novel and switchable functionalities. Possible and exciting applications include materials with unusual properties such negative Poisson’s ratio, phononic crystals with tunable low-frequency acoustic band gaps, reversible encapsulation systems and systems capable of spontaneously switching between achiral and chiral configurations. 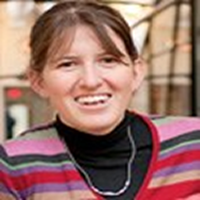 Katia Bertoldi is Assistant Professor of Applied Mechanics at Harvard University. She earned master degrees from Trento University (Italy) in 2002 and from Chalmers University of Technology (Sweden) in 2003, majoring in Structural Engineering Mechanics. Upon earning a Ph.D. degree in Mechanics of Materials and Structures from Trento University, in 2006, Katia joined as a PostDoc the group of Mary Boyce at MIT. In 2008 she moved to the University of Twente (the Netherlands) where she was an Assistant Professor in the faculty of Engineering Technology. In January 2010 Katia joined the School of Engineering and Applied Sciences at Harvard University and established a group studying the mechanics of materials and structures.